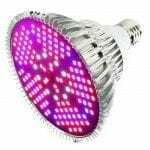 Advanced Platinum has been around for a while and their lights are well known in the LED grow light market. This Advanced Platinum Series P600 is one of their larger lights and suitable for larger grow operations. If you are looking for a bit more high-end lights and have ambitions to expand your operations, you have to read this review. This light gives great coverage and yields for a very fair price. We tell you what you need to know about the Advanced Platinum Series P600. The Advanced Platinum Series P600 grow light offers a complete 12 band light spectrum, mimicking sunlight. It has ultra-violet and infrared light. Advanced Platinum has very-efficient drivers and high-quality diodes. The intensity of light emitted is measured by PAR. 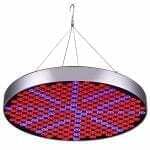 This light has a great PAR/watt ratio, 1140 PAR/watt from 24 inches from the canopy and 1535 PAR/watt from 18 inches. This makes the light 2-3x more intense compared to other lights. 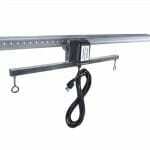 The high-quality material makes the grow lights extremely durable. 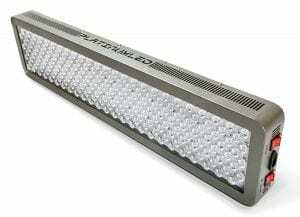 Advanced Platinum uses 200 LED diodes of 3W each, USA-made. Individual diodes have Zener protection to keep them from harm and increase durability. This allows the plants to absorb more light and grow well. The Advanced Platinum Series P600 has quiet fans and aluminum heat sink installed which monitor the temperature and cools the lights thus reducing the power bills up to 50%. Most LED grow lights emit only 40% of usable light but this one emits 100% of usable light. Thus wasting no light and saving money. A switch on the Advanced Platinum Series P600 allows changing the program from vegetative to flowering stage. In vegetation, the light is purple/blue focusing on leaf development; however, in blooming it is pink/red helping in growing big, healthy buds. If you see any odd changes in the plants during blooming, adjust the height of the light a few inches away from the canopy. Average energy used for vegetation is 184 watts and bloom is 368 watts. 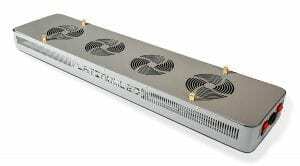 It gives you the same result as an 800W HPS but lesser power usage. If you have a 4×4 grow tent, this light is highly recommended. The yield increases if the light is more concentrated. Larger areas can be covered if you buy a few of these by using the daisy-chain option. This will cover the area in an efficient and uniform manner. For smaller tents, there is the Advanced Platinum Series P300 that provides a smaller coverage area with similar results and the same output in return. The highest coverage can be obtained from 18-24 inches away from canopy during vegetation. Whereas, during blooming 5 feet by 2 – 2.5 feet from 18 inches away from the canopy will give similar results. The ideal setup is 1 plant/square-foot of the tent. It can be plugged into a 15 amp power outlet thus it has negligible energy consumption for the results; which justify its purchase in long run. It’s a power efficient and affordable option compared similar grow lights. 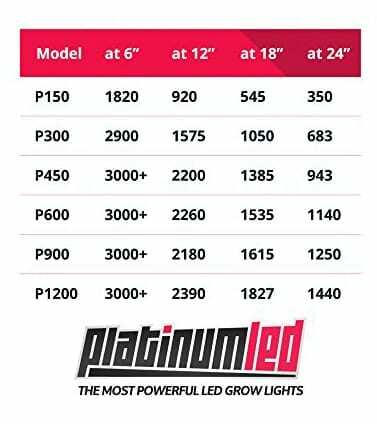 The Advanced Platinum P600 has a 5-year warranty with 90-days money back guarantee if the results are not to your satisfaction. Very few other manufacturers give you a 90-days money back guarantee. The lifespan of the grow light is 8 – 10 years. 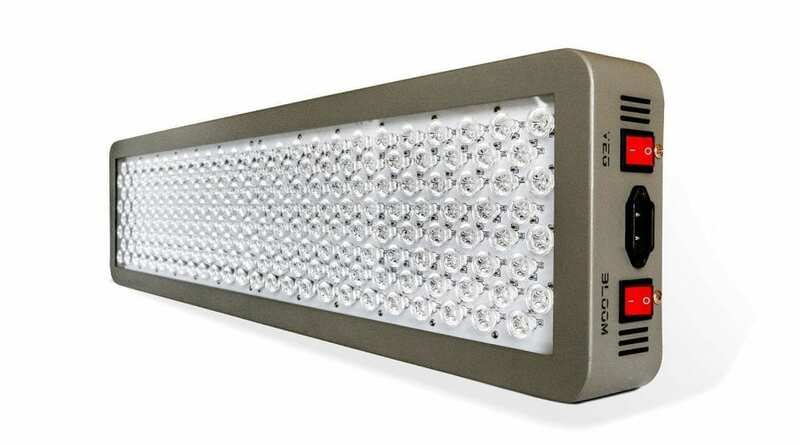 The Advanced Platinum Series P600 already has highly efficient bulbs as well as a durable build. After purchase, you can be at complete ease due to its warranty policy. Advanced Platinum also has an exceptional customer service. They are sold from the manufactures so there are no markups or chance of a resold product. Advanced Platinum Series P600 600W has a rating of 4.6 stars out of 5 on Amazon. The grow light should be your first choice if your key concern is yield and not money. The long lifespan of the light makes sure that, on average, you pay the same for lights each year, as when you go for a budget light. Although the price point is a bit high within the first couple harvests you’ll earn your investment back. The purpose of the light is to increase yields and grow heavier resinous buds. The warranty ensures you will not need to replace it; results ensure that you don’t want to. 100% light emitted is usable. 200 pieces of US-made LEDs. Fully adaptable to the global voltage. Are you interested in a broad product overview of the Advanced Platinum P600? PlatinumLED made a nice video about their product. You can watch the video below. The powerful Platinum P600 delivers your desired results. In addition to the output of the spectrum, it creates the optimal conditions for a beautiful growth of your plants. Due to its full rich output of 12-band spectrum, it feels like that you have sun in your home. The plants will get everything they want for healthy growth. You will not find a better option, in this price range, than the Advanced Platinum P600 if you have to cover a large area in your garden or tent. It’s a perfect grow light to buy for the serious indoor plant growers. The 5-year assurance guarantees that you will never replace it. So, if you truly want your cannabis, vegetables or flowers to grow to their maximum potential, you have to get the Advanced Platinum Series P600. We guarantee you that you will love it as much as we do. Looking for a cheaper light with the same size? Check out the Phlizon Newest 900W or the Viparspectra 900W. Want to know more about the different growing methods? Read about hydroponic systems.